The PT100SBS summing boxes are high-quality summing boxes with individual load cell adjustment for the weighing industry with a durable stainless steel housing. Fitted with liquid tight strain relief cable fittings. The PT100SBS accepts a wide range of cable diameters. Enclosed in a tough stainless steel housing, easily accessible yet securely closed and positively sealed by way of it's screw on cover and external fixing holes. Designed and produced for the installer, with jumpers for summing without attenuation and simple to reach and positive control trim pots for load measurement correction. 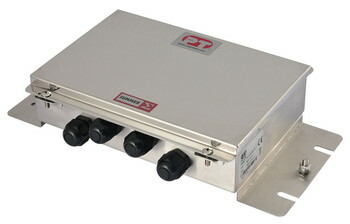 The 8 way also contains surge arrestors appropriate for weighbridge and large tank and silo installations. Brochure for PT100SBS Stainless Steel Summer boxes.